Our church landscape is changing exponentially, and it can be difficult to follow the latest church best practices—let alone vet them and put them into practice! In 2019, how can our churches do their best work in being the church? In March, we hope to answer some of these questions. If you’re interested but can’t make the workshop in person, we’ll also be live-streaming it for anyone who’d like to join us via webinar! More details on that soon. There is no fee for this event! Instead, guests are invited to offer good-will donations to help cover the costs of our refreshments (breakfast, lunch, and snacks will be provided). 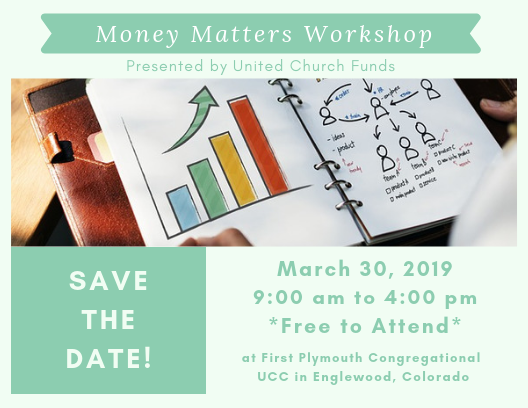 In addition to UC Funds, the event will also be presented by the Church Building & Loan Funds (CBLF) and OPTICS (National Office of Philanthropy, Technology, Communications). We’ve created a “Save the Date” graphic that we hope you share & post with your audience(s). More details will be shared as they are finalized. If you plan to attend, please let us know; this will help ensure we have enough space, food, supplies, etc. You can also reach out if you have any questions. We hope to see you there!